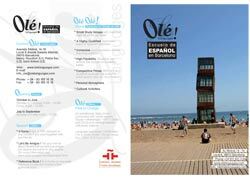 Spanish Courses in Barcelona - Spain, Learn Spanish at the best schools in Barcelona. Olé Languages is a professional Spanish language school in Spain dedicated to teaching Spanish as a foreign language in an open, personal and enjoyable atmosphere in Barcelona. We offer intensive Spanish courses for all levels to best competitive prices taught by dedicated, highly qualified native Spanish speakers *. We hope to see you soon in BARCELONA! * Read here why expensive Spanish schools won't offer you better Spanish classes. end of my intensive course? How can I make the payment? What happens if I need to cancel my course?